U.S. District Judge J. Waties Waring was the son of a Confederate soldier but later became a hero of the civil rights movement — though he was vilified for his views. On Friday — more than 60 years after Waring was one of the first in the Deep South to declare that forced segregation was unconstitutional — the city of Charleston will honor him with a life-sized statue. In a forceful dissent, he wrote that segregation was “per se inequality.” This made him the first federal judge to take that position on “separate but equal” since Plessy v. Fergusonin 1896. His dissent helped pave the way for the U.S. Supreme Court’s Brown v. Board of Education ruling in 1954. U.S. District Court Judge Richard Gergel, who today presides in the same courtroom where Waring sat more than a half century ago, has done exhaustive research into Waring’s life and career, poring over the rich trove of personal papers that Waring left behind. Gergel has struggled to understand how a man who grew up in a family devoted to the “Lost Cause” of the Confederacy could come to embrace such divergent views on civil rights. 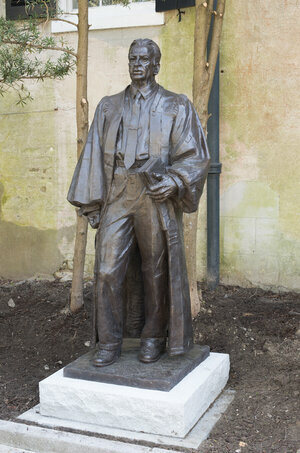 Sculptor Richard Weaver created this life-sized sculpture of federal judge J. Waties Waring. Gergel has come to believe that Waring’s views evolved as a result of his time on the bench, that the weight of responsibility he assumed as a federal judge changed him. He points to a number of cases Waring presided over prior to Briggs. A 1944 case involved an African-American teacher who sought equal pay with white teachers, who were paid a third more than blacks. Until then, no black plaintiff had ever won a civil rights case in a federal district court in the Deep South. In court, Judge Waring pressed a school board lawyer about the inequities, citing an earlier court decision that had already found race-based pay scales unconstitutional. 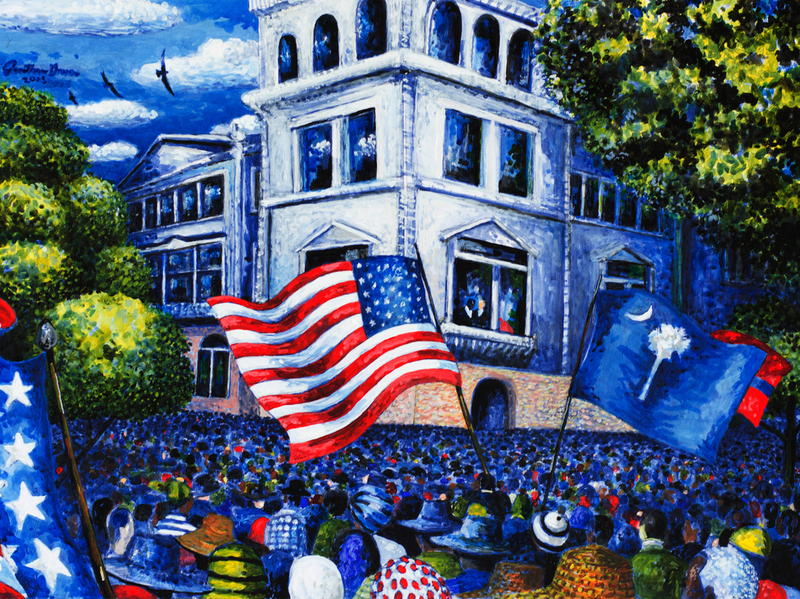 This painting, by artist Jonathan Green, captures the scene outside the Charleston Federal Courthouse on the day oral arguments were heard in the Briggs v. Elliott case challenging racial segregation in public schools. That decision was the catalyst for attacks on Judge Waring so intense that he required 24-hour security. Crosses were burned in his yard. Rocks were thrown through his windows. Waring was alienated from most of white Charleston. A local magazine described him as the lonesomest man in town. The Briggs school segregation case in 1951 would cement Waring’s place in civil rights history. Sitting on a three-judge panel, Waring considered other court decisions that had chipped away at “separate but equal” in cases involving higher education. He concluded that separation is never equality, that segregation is per se inequality. Although the other two judges did not agree, the groundwork had been laid. “That conceptual leap is really the foundation of Brown,” Richard Gergel says. In an oral interview Judge Waring gave several years after retirement, he spoke of the Briggs case, and how moved he was to see the huge turnout among African-Americans for the oral arguments. Having traveled in from the countryside, they lined the streets outside the courthouse for as far as the eye could see.